Product prices and availability are accurate as of 2019-04-12 05:58:55 EDT and are subject to change. Any price and availability information displayed on http://www.amazon.com/ at the time of purchase will apply to the purchase of this product. Punch! Home Design Studio Pro, for the Mac, makes your home design experience more powerful than ever. Written from the ground-up, for Mac users by Mac users. All the tools you need--work smarter and faster with simple tools that make designing as fun as it is powerful! All the tools you need to design your house inside and out, right out of the box. Start designing right out of the box with the intuitive interface, assistants for cabinets, roofs, etc., editable room & deck templates, plus the extensive drag & drop library. Add ambient realism with Precision Lighting Planner. PhotoView lets you personalize your design with imported photos. 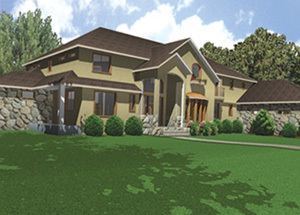 Design your house inside and out. Estimator--Track costs, as you draw, then view your estimate schedules in a handy, spreadsheet format. Fireplace Assistant--Create a custom, editable fireplace, based on criteria you select--includes style, mantel, hearth, firebox, building material, & chimney options. Door & Window Designers--Customize doors and windows for your projects--custom panels, and grids—all to your specs! Global Sun Positioning--Set scientifically precise lighting angles, based on your position on earth, date, time, and daylight savings time. Room Assistant--Plan your space, input dimensions, and walls are auto-generated to create your rooms. Site Planner--Enter coordinates from your plot plan, legal description, or measurements and your property line is drawn for you. Fillet, Inverse Fillet, & Chamfer tools--Use these powerful editing tools to easily customize your designs. Object Organizer--Create custom categories, then move objects from library to library, so you can quickly locate your favorites or organize them the way you use them. DXF/DWG Import & Export--Convert existing drawings to Punch! files or use the export option to share a drawing file with a friend or architect. Video Tutorials--Watch and learn with video tutorials. 3D Custom Workshop Pro--Edit existing objects and design, download, or insert your own CAD objects to expand your library. Google SketchUp Import (3D Custom Workshop Pro)--Import predrawn objects--thousands available on the web-—to convert and use in your Punch! drawings. 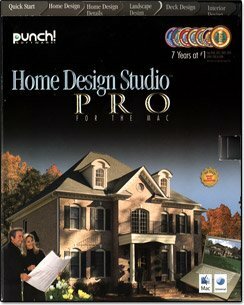 Other enhancements include—Content Panel, visual aspects, faster performance, editable planting details, onscreen detailing of lights, windows, doors, cabinets, & crown trim; export option for compatibility with older versions of Punch! Home Design products & file compatibility with our new line of PC products. Get the professional results you’ve come to expect from Punch! Software—along with a fun, easy-to-use interface.